NYFW: Swatch Presents Quail, Models and Ice Cream! | Fashion. Style. Beauty. | Life is short. Live well. NYFW: Swatch Presents Quail, Models and Ice Cream! While I’m at the tents, I thought I would tell you about a little fun fashion presentation that’s happening tomorrow. Iconic Swiss watch brand Swatch will showcase Michelle Williams indie-fashion favorite line Quail‘s Spring 2010 line out of an ice cream truck! So not kidding. On September 11th from 2-4pm, models will strutting around in the fabulous clothes, handing out some super-delicious (and I’m sure figure-friendly, fashionable ladies) Van Leeuwan ice cream cones to VIP editors, writers, photographers, media members and buyers in front of the tents at Bryant Park. 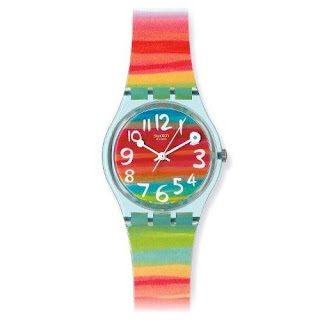 Some very special guests will even receive new Swatch watches from the Fall/Winter 2009 collection . If you’re going to be near the tents/in the tents/living at the tents like the rest of us, here’s how to score a free Swatch watch: follow Swatch on Twitter (@SwatchUS) and get each code word tweeted to you, then say the code word to one of the Quail models wearing a Swatch at the Ice Cream Truck. That’s how you can win a free Swatch (while supplies last). last! So, when you see me noshing on a fabulous ice cream cone with a blingy new watch, don’t hate on me. I’ll be there and you should, too!